Wrenbridge have just submitted the final plans for the redevelopment of Bircherley Green Shopping Centre after months of discussion between themselves and East Herts Planning Department, local groups, residents and more than enough statutory consultant bodies such as the Environment Agency and the Canal and River Trust that you can throw a blueprint at. If you really must read all about it then follow this link to the planing page and read as many documents as your brain will allow: Documents relating to application. This small piece of real estate almost lost in the middle of twentieth century expansion has consumed the minds of the good and great since 2014. It is contained within the Hertford Conservation Area but as everyone admits it is not the most attractive group of buildings to grace this ancient, market town. So why has it got everyone defending it and wanting to counter any change? Because Hertford is an ancient English market town. I doubt if anyone who has contributed to any report listed above has bothered to walk the streets recently. They might have a different opinion if they had; so I will save you the trouble of visiting the town yourself and explain how Hertford fits into this mind set. Hertford has seen a return to the old traditional crafts of tattooing, vaping, nail polishing and video gaming. Many shops have adopted a simple Dark Ages colour scheme of black or dark battleship grey eschewing the more modern trend towards hand painted signage above the door applied with mahlstick and sable brush. The inns and taverns that were found in almost every house the length of Fore Street and Back Street (now Railway Street and Maidenhead Street) have been replaced by bars and venues serving ‘craft’ beer from metal kegs and poured from bottles containing ales and stouts that were never brewed anywhere in the county or for that matter, the country. The old coffee shops have given way to transatlantic coffee shops with even stranger sounding names where no face to face commerce takes place apart from a Wi-fi link and where a cup of coffee costs more than a pack of Java beans from a supermarket shelf. Thank Heavens for Rose Cafe which stands by the traditional methods and where you can still buy a traditional cup of Nescaff for under a pound and it is brought to your table with saucer almost as soon as it is ordered. Unfortunately many staple mid seventeenth century meals such ‘boyle beef, porch, rost beef and cheese’ have been replaced by a growth of restaurants with a distinctive Italian flavour and a slight hint of Turkish. This type of Continental fayre is thought to have been brought over to this country by the growing number of Italian students eager for a sight of their Shakespearean heritage behind the modern facade of estate agents and charity shops. Do seek out the commercial sector, many of the inns and stores that sold these hot and cold vittals are still there. Many are seventeenth and eighteenth century buildings; one or two are thought to be sixteenth century. The timber framing and plaster boarding have been protected for posterity by the application of twentieth century concrete. You cannot see the original design or view the interior as they are mostly private offices but they are all to be found in the Department of Environment List of Buildings of Historic or Architectural Interest being at least of Grade II standard. As befits a medieval town the road system is all that you could wish for. The town centre layout has not changed much since the early seventeenth century as Spede’s map of 1611 shows. 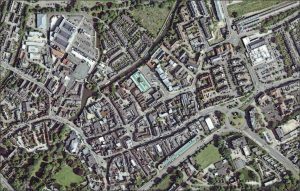 Fore Street and Back Street mentioned above can be plainly seen leading from Hertford Castle in the centre to the town’s eastern boundary. Not only is the road system exactly the same as it was over four hundred years ago, so are the roads. The cobbles have no mortar to bind them, broken slabs on the pavements catch the unwary lady with high heels and pot holes peer though the thin tarmac on the surface of the roads to laugh at motorists. Hertford was built for the horse and cart and this is still the best form of travel through town although there are now no inns to stable your horses which is a bit of a stinker. But fear not, you can still park your car – for a fee – before the Beadle catches up with you. Did I mention Hertford Castle? It did exist but the unwary visitor may find it hard to find. All that remains is the grassy mound on which the original Norman motte was built. What we call ‘the Castle’ is actually the gatehouse rebuilt by Henry VIII in the early sixteenth century and then parts of it were blown up by the Duke of Devonshire in the nineteenth century. No medieval town could be without its castle; or its market. There is a Charter Market on Saturdays which struggles to fill the available space. No longer are cattle herded down Fore Street to be sold at market behind the old inns that stretched to All Saints churchyard at the rear. I suppose this might be a good thing as they might wander along Gascoyne Way and cause traffic to snarl up all along the A414 east and west, which of course never ever happens at all in these more enlightened times. This is why report after report from agencies as diverse as Historic England and Waste Services have been damning the application to redevelop Bircherley Green Shopping Centre in a bid to protect Hertford’s heritage and architectural beauty from the ravages of the Twenty First century – and urge us all to continue to embrace the legacy of the Saxons, the Norman Conquest, the Plague and the Poor Law. It is now all in the hands of the East Herts Council Planing department – we await their decision. Previous Previous post: Town councillors vote 3-0 to throw out Bircherley Green plans – No! !